We ended the first section of this two-parter with the question ‘Who conquered who?’. In this part we ask further hard-hitting questions: ‘Who entered whose history?’ and ‘What about the women?’ Barbara Mundy sets the scene eloquently: ‘What took place in the Basin of Mexico between 1519-21 was chaotic and inexplicable in its moment, with individuals only partially experiencing or learning of events that were happening in different places, at different times, like fragments of a broken mirror. Historical narratives, beginning with the letters of Hernando Cortés, have gathered up the fragments, setting them out into chronological order, choosing some as causes, others as effects, enhancing some, neglecting others. Today we encounter these narratives as uniform rivers of words on the page or on screen. Up until the middle of the last century, historians had been largely content to stay within the confines of the historical narratives whose limits were set out in the sixteenth century. Over the centuries, these time-travelers - Francisco López de Gómara, Antonio de Solís, William Prescott - followed the course of the same dry river bed leading to the past. Their eyes squinted to catch sight of the familiar landmarks (the burning of the ships at Veracruz, the assassination of Moteuczoma, the massacre at Cholula) along the way. ‘But when I walk up that riverbed, and raise my eyes to look at its banks and beyond, I see ghosts. Legions of them, standing along that riverbed of history, massed together along its banks, looking at it course. They are all silent. And they are all women. Elizabeth Baquedano reveals more about the life and importance of Doña Marina: ‘The Conquest of Mexico was not made by 550 Spanish soldiers or by the superiority of their weapons. 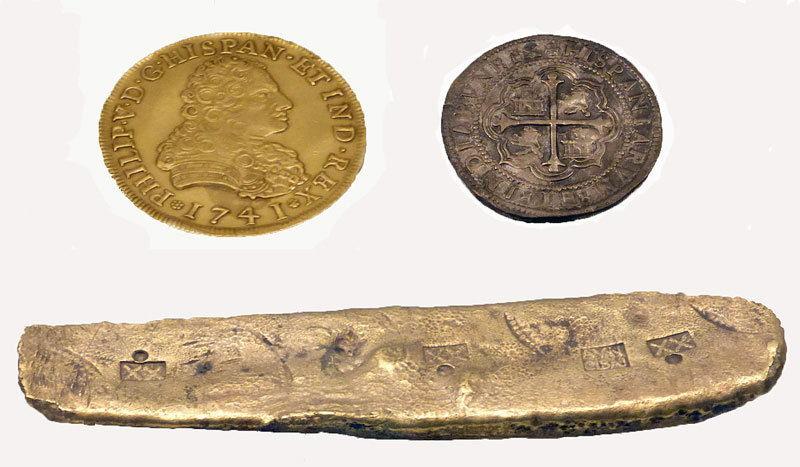 The Conquest was made by a number of factors that contributed to its success in less than two years. Noteworthy was the contribution made by several native groups of Mexico who allied themselves with the Spaniards and by the help of a remarkable indigenous woman who became Cortés’s interpreter Malintzin, also called Doña Marina by the Spaniards. How did the Spaniards perceive this woman who was so essential to their success. 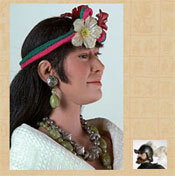 How did the indigenous people portray her in their histories of the Conquest? 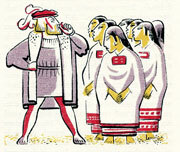 La Malinche, Malintzin, Malinalli and Doña Marina are all names commonly used when referring to Cortés’s indigenous interpreter. This extraordinary woman was born sometime around 1500. Her life before the encounter with Cortés and the Spanish army is not altogether well known. Malintzin was the daughter of a noble family near Veracruz but at the age of 5 she was sent away from her people to live in Tabasco with the Maya where she remained and learned a Maya tongue. One of Cortés’s soldiers, Bernal Díaz, claimed that her mother and stepfather sold her to merchants. 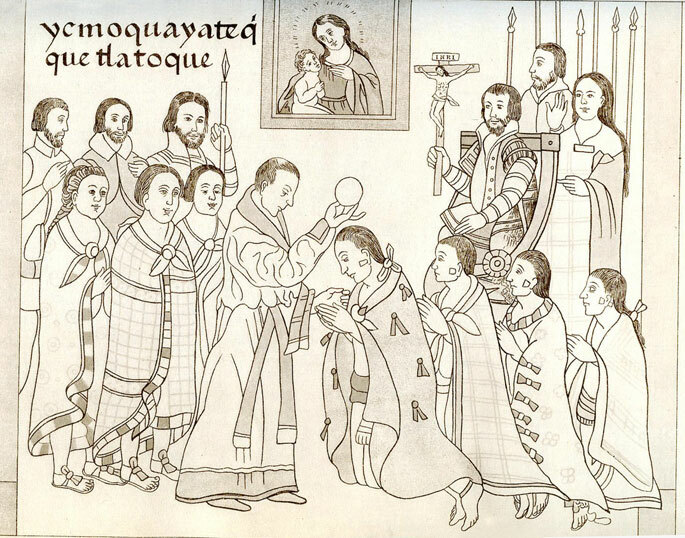 ‘In March of 1519, after a fierce battle against Cortés and his men the Maya chose to cooperate with the Spaniards and gave them food, gold and twenty slave women one of them was Malintzin later baptized and renamed with the Christian name of Marina. Jerónimo de Aguilar a Spaniard who had traveled before Cortés and had resulted in a shipwreck had lived in the Yucatan peninsula as a slave for eight years. Cortés had recruited him to act as translator. 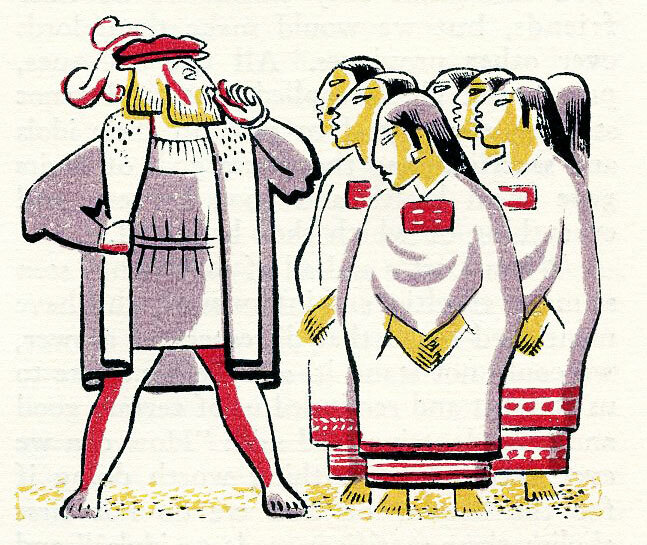 Moctezuma sent messengers to speak with Cortés but his translator –Aguilar- was unable to communicate with them as he was only able to speak Yucatec Maya while the messengers spoke Nahuatl. ‘It is at this point that Malintzin became indispensable to Hernán Cortés. 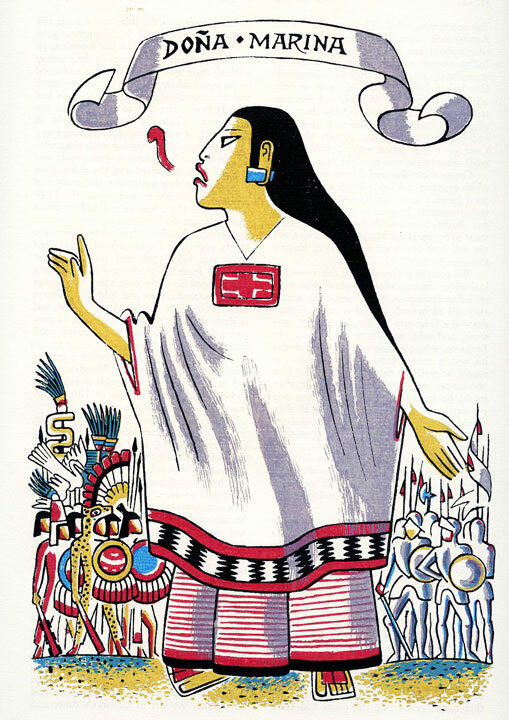 As a native Nahuatl speaker she was able to translate from Nahuatl to Maya, which in turn could be translated into Spanish by Jerónimo de Aguilar. This role made Malintzin essential during the Conquest period. 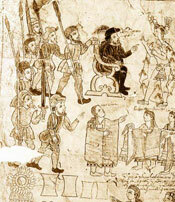 As translator to Hernán Cortés, the actions of Malintzin were a key factor in the fusion of pre-Colonial and Spanish societies. She soon learned Spanish as well. 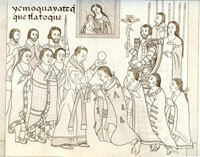 Besides being an indispensable translator Malintzin showed her allegiance to Cortés rather than to her own people. Malintzin changed the course of universal history. The many different roles she played can perhaps best be seen in the Lienzo de Tlaxcala where she is represented 20 times. She is often depicted as the central figure and is bigger in size than Cortés. She often dominates the scenes. 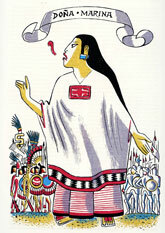 ‘Malintzin acted as a diplomat, she was able to negotiate mediating all relations between Cortés and his native allies such the Tlaxcaltecas. She was the first to establish a political speech According to Baudot (1988) “es la autora del discurso politico de la Conquista”. She was the first woman to take a definitive role in a man’s world. Though many of the images from the invasion bear witness to the horrific suffering endured by the indigenous peoples at the hands of the Spanish, we leave the last word to Susan Gillespie whose final sentence is uplifting: ‘The fateful encounter between Spaniards and Aztecs that began in 1519 is often represented as a “clash of cultures.” Many such meetings between “The West” and “The Rest” (of the world) are considered a “culture-clash,” but the phrase is especially pertinent to this specific historical event. 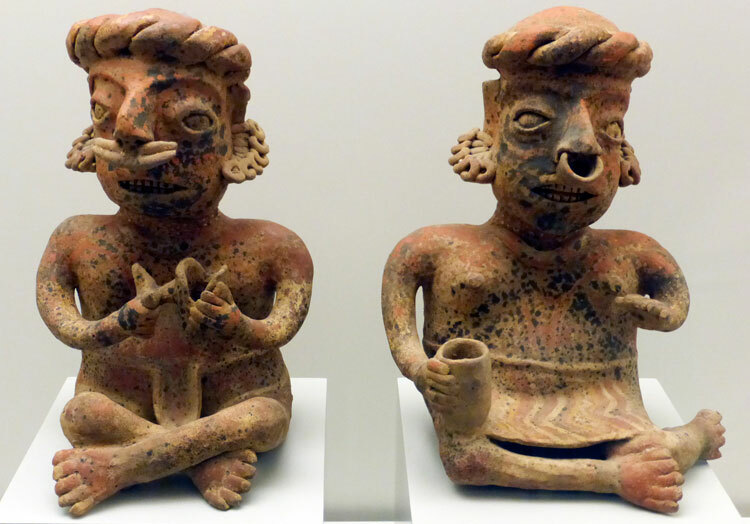 From the early descriptions of Aztec culture penned by Spanish conquistadores and friars, further embellished over the centuries, we have inherited a view of the Aztecs as not only strange and exotic, but as the most horrible, brutal, and bloodthirsty people of antiquity. 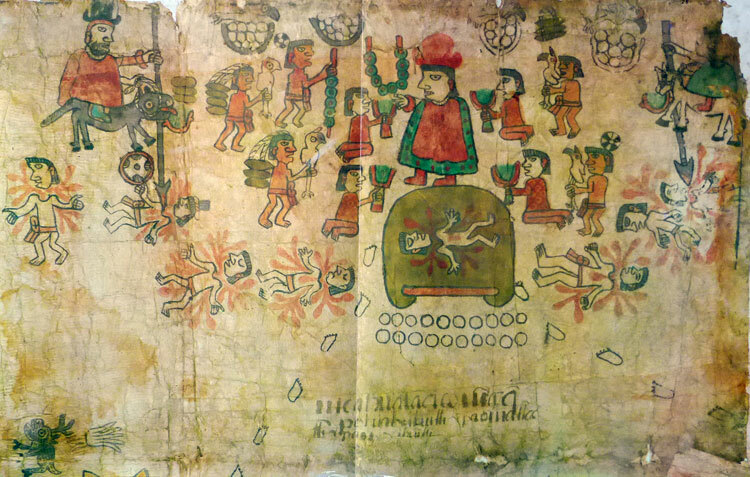 Art historian Esther Pasztory* argues that the Aztecs fill a niche in our Western view of the world’s peoples: some group has to be the most violent, barbaric, and awful so that they can be compared unfavorably with everyone else. The “clash of cultures” metaphor is about difference, and the Aztecs always come off looking, if not truly terrible, at least very different from us. 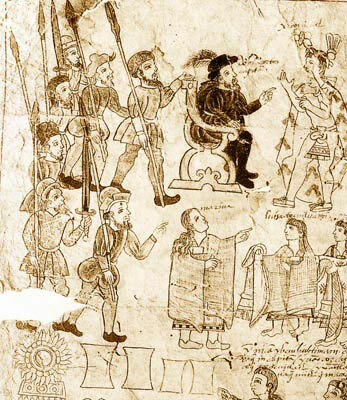 The contrasts between Aztec and Spanish (as Western) society, culture, religion, and technology are standard fare for books and media directed to students and the public. Second, Frances Karttunen leaves us a challenging question for students to tackle: ‘“The Aztec sphere of influence should not be called an empire, and the Aztec rulers should not be called kings.” Do you agree on disagree? Explain and give examples.’ Good luck! • Pix 9 & 10: photos by Ian Mursell/Mexicolore.